Before my babies, I had no idea what to expect during childbirth and neither did my husband. Yes, we took classes. Yes, we asked our doctor questions. We did everything we knew to do to prepare, but even with all of our preparation, in the heat of the moment, everything went out the window. It was the blind leading the blind. Just two idiots trying to bring life into the world without dying. While recounting my first birthing experience, a friend was like, “Man, you should have gotten a doula!” “A whaaa...?” “A DOULA Brooke!” I didn’t even know what that was! In this interview, Kate Danson teaches me about her work as a Doula and it's amazing. What the heck’s a doula? A Birth Doula provides physical and emotional support through pregnancy, childbirth, and the postpartum period, informing and empowering individuals and/or couples to trust their inner knowledge through this rite of passage. During labor, the Doula’s job is to focus solely on the needs of a birthing person and partner, guiding them through the use of breath, gentle massage, and visualizations. However a person chooses to birth: un-medicated, medicated or via cesarean, a doula is there to empower you to make the right decision for You. We are there to hold space. Doulas are pregnancy, birth and postpartum educators and counselors. Because doulas are not trained medical professionals like doctors, midwives, and nurses, we do not divide our focus between the physical and emotional health of the mother and baby. We tend to the emotional needs of the individual or couple. We are there to whisper words of encouragement and to check-in emotionally during this process. And we are there to celebrate you in the end. And sometimes birth support is as simple as running to get food for a family member who needs some nourishment, refilling water bottles, and sitting quietly because the birthing person is so in the zone they don’t need any hands on support. When did you decide to become a doula and what was the journey like? In 2012, my stepsister asked me to attend the birth of her first daughter. She and I have always been close, so there was no question in my mind that I wanted to be there. My own birth was a somewhat traumatic entrance into the world. My mother suffered a stroke during labor, which resulted in her struggling to recover mobility for months. The story of my birth created a curiosity to understand how our own birth stories affect our lives. My family astutely said they thought it might be healing for me to see a birth first hand. And it was. Witnessing the birth of my sweet niece and seeing her take her first breath, changed me forever. I felt like I was seeing something divine. My sister’s wonderful midwife, Debbie Frank, pulled me aside after the birth and said that she thought I would make a lovely doula. I really didn’t know too much about Doulas at that time, but her encouragement stuck with me. A year later, one of my dear friends said she was taking a Birth Doula training and I went with her. And that was that. I decided to let go of pursing an acting career full time and gave myself over entirely to birth work. Tragically, Debbie Frank is no longer with us, but I will forever be grateful to her and my sister for lighting this path. I studied with Ana Paula Markel at Bini Birth. Most doulas in Los Angeles have been through her certification program. She is such a beautiful force in the birth world, bringing so much awareness and light to the importance of creating support around women during the transition into motherhood and ushering new doulas into this calling. The training is one weekend. I then went on to do advanced studies with Erica Chidi Cohen who is another brilliant doula and dear friend who recently co-founded Loom, an inclusive community for people on the path to parenting. I am so excited about everything she’s creating at Loom. She’s put together an incredible collective of doulas that I am so grateful to be a part of. I became a certified Lactation Educator-Counselor in 2015. And then in 2016, I completed Postpartum Doula Training, again at Bini Birth. I spent some time studying Ayurveda and it’s benefits during the postpartum period, and now incorporate Ayurvedic massage and food preparation into my postpartum work with new families. How many times do you meet before the baby comes and what do those meetings look like? I meet with my clients about three to four times before the birth. The prenatal visits are a chance to get to know each other and for me to get a better idea of how I can be supportive during their birth experience. We discuss EVERYTHING... the basics of childbirth, the stages of labor, hospital procedures, comfort measures and relaxation techniques, breast and bottle feeding, what they need to feel prepared for the postpartum period, and we will explore any fears and expectations that may be coming up. And sometimes this just looks like us sitting on a sofa and having tea and catching up. Was it difficult to get those first families? The beautiful thing about my experience with birth work is that I haven’t come up against many roadblocks in finding families. People are having babies all the time and the word doula is much more understood now, especially in Los Angeles where I live. Up until I became a doula, I experienced the frustration of wanting to be an actress but feeling like it was an uphill battle to create work. The inability to do what I loved all the time was so difficult. But once I decided to become a doula, it felt like everything came into alignment. Work was flowing and easy and joyful. For the first two years, I co-facilitated a women’s circle called The Birth Stories with my two friends and fellow doulas Paula Mallis and Vanessa Halby. These circles were such a learning experience for me as a new doula and much of my work came from meeting women in this space. Now that we’ve moved on to other experiences, families find me through my website or word of mouth. How many births have you assisted with since you started? I am nearing 40 births! I can’t believe it. And yet somehow that doesn’t feel like many. What was the longest labor you’ve ever attended? I was at a three-day birth recently. Unlike the incredible birthing woman, I was fortunate enough to sleep one those nights! I bow down to a woman’s strength and determination. We are magical. What is the main reason someone would choose to have a doula? I LOVE this question! I truly think everyone should have a doula. I think it is the missing link in creating a holistic birthing experience. And don’t we all, whether we recognize it or not, ultimately want that? To feel like our emotional experience is as cared for as our physical body is. Whether you’re at home, a birthing center, hospital, or even via cesarean, doula support is so valuable. Birth is filled with a lot of unknowns, even if it is the second or third or fourth! I think a doula can help you walk into your birth feeling prepared and supported emotionally so that you can let go and trust the experience. What are some tips for expectant mothers who can’t afford the doula experience? First, there are so many new doulas looking for experience that charge very little for their services. Carriage House Birth is a wonderful collective of doulas that have new doulas that begin at $300 and then the more seasoned doulas go up in price. There are also incredible volunteer doula collectives like LA Doula Project and Joy in Birthing Foundation that offer pro-bono doula services to lower income families. This type of support should not be limited to those who can afford it. If the idea of hiring a doula doesn’t resonate with you but you’d like to create a supportive environment around you, you can absolutely do that without a doula. I think it’s important to educate yourself. I hear women say that they’re afraid to learn too much about birth because they don’t want to scare themselves. I understand that. But I would say it’s important to at least educate yourself about what your birthing options are so that you feel empowered during your birth. Take some time to get clear about your needs and communicate them with your support net of friends and family or whoever it is that will be around you during your birth and postpartum period. Anything husbands should know about childbirth that they don’t usually learn? To all the husbands/partners out there, you are so valuable in birth. Although you may not be doing much in terms of making your loved one “feel better” your presence and gentle support, your love and affection during birth, can help speed along the process more than you know. A midwife once cleared the room at a birth I was attending and said it was time for the couple to cuddle and make out because she felt the labor was stalling. What makes a baby, the love and affection, is also what helps bring a baby into the world. It’s what makes a woman feel safe enough to open up and give herself over to the process. And to all the women out there who are doing this on their own, I would reframe that as, create a nurturing gentle bubble around you during birth, ask your birth partner to massage you, speak quietly, encourage you. That’s really the core of what this midwife meant. What happens at aftercare with a doula? Postpartum Support is EVERYTHING! Whether you hire a postpartum doula or you ask a friend or loved one to help care for you, it is a must. I had been a birth doula for a few years when it dawned on me that I was leaving families right when things were about to get REAL. Having a newborn is exhausting, challenging, exhilarating, and the physical recovery after birth can be a thing. It’s one of those things we don’t often talk about as a culture. The baby is born and we put the focus on the baby not the mother who’s physically recovering from pregnancy and birth for at least six weeks postpartum. So as a postpartum doula, your job is to look after the mother. I cook warm nourishing meals that help the body heal, I counsel any breast or bottle feeding issues that may arise, I do warm oil massage to help calm the nervous system, I teach baby care practices, and I help prepare sitz baths and anything else the woman may be using for healing. Most of all, I’m there to simply hold space for the new mother, listening to what’s coming up for her around motherhood and reassuring her that she’s beyond capable. It’s such a beautiful time that flies by and I love being a part of it. Your birth photography is so beautiful. Tell me a little about it! My first love was photography. I studied Fine Art + Photography at the ArtCenter in Pasadena. I’ve always loved portraiture and journalistic photography and I feel like birth photography is an extension of that, capturing such a raw and intimate moment in a person’s life. I am so grateful to be able to incorporate it into my birth work. I am often hired by my doula clients to photograph their births, but I also work just as a birth photographer. The bonus of that is that it’s almost impossible for me not to be a doula in the room so you end up getting a little of that support anyway, minus the prenatal preparation. 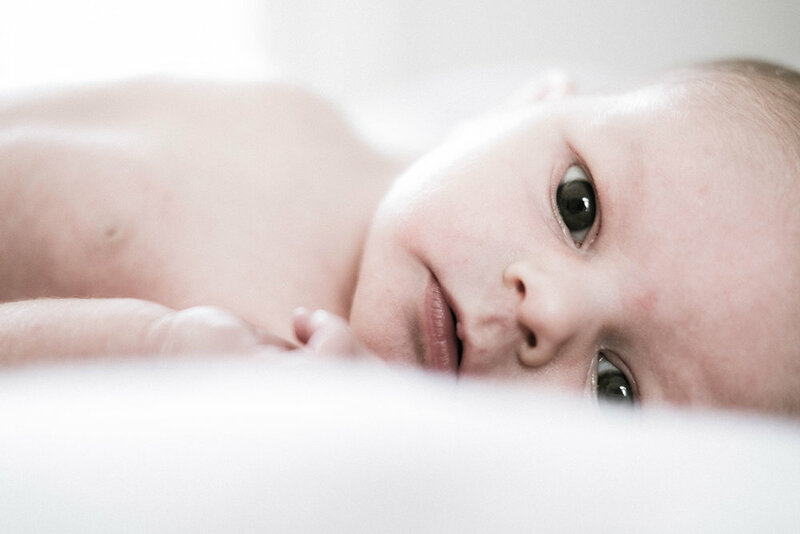 I also include newborn and family portraiture in my photography offerings. I gravitate towards natural, day-in-the-life photography. The sessions are very relaxed and at your home which I think makes for a much more honest depiction of those days and weeks following the birth of your child. I love looking at glossy images, and sometimes I make them, but I find myself moved more by honesty in photography and strive to find that in my sessions. You’re present at one of the most intimate times in a person’s life. I imagine you form really close bonds with your clients. Have you ended up with lifelong friends? Oh my goodness yes! I feel so close to the women and partners I’ve worked with. It’s such an intimate experience and feel so fortunate to be trusted enough to be a part of it. And then there’s the babies... there’s nothing I love more than seeing them grow up. My last birthday party was a daytime party so that all my friends with kids could come, and as I stood there looking around at all of them, I realized that I had seen many of the little ones come into this world.